As slips and falls are the leading cause of restaurant insurance claims, it is imperative to properly place and maintain floor mats to avoid employee and customer injury. NY Restaurant General Liability can be reduced by following these suggestions. Safe Mats- Mats with high density rubber backing is the best for restaurant usage. Withstanding the relative foot traffic is also essential, so consider the size and thickness of the mat. Ideally, a hefty mat inherently prevents sliding or slipping as its weight holds it down. 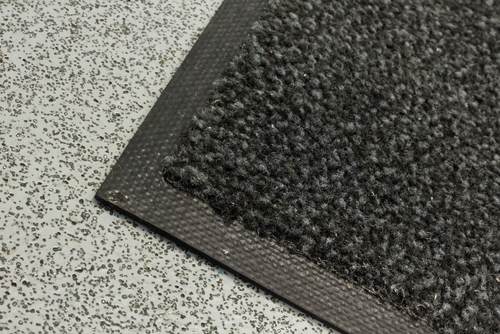 Next, consider using absorbent mats with beveled edges to reduce the risk of tripping and slipping. Mat Arrangement- Mats should always be placed in high traffic areas and places where liquids or other slippery materials are more likely to spill. This includes kitchens, next to entrances and exits, under coffee stations, next to soda dispensers, under sinks, etc. What’s more, mats should be placed behind doors to catch debris. However, ensure the door’s operation is not blocked by the mas as this can increase tripping concerns. Mat Cleaning- According to Webstaurant Store, mats should be vacuumed daily, scrubbed with a water-based detergent or shampoo to remove spots, and should be rinsed and allowed to fully dry before they are returned to their original location. For storage, experts recommend rolling the mats up and placing them flat on the ground. Avoid storing mats on their sides as this causes bumps and tearing in the material. Lastly, never wash the mats in the dishwasher as they are not designed to undergo the intense heat and harsh chemicals. At RMS Hospitality Group, we are dedicated to protecting restaurants like yours. Our comprehensive coverage provides protection against a broad scope of exposures your businesses and employees face to promote your success and longevity. For more information, contact us today at (888) 359-8390.